This elaborately-robed bodhisattva is an image of Guanyin, or Avalokiteshvara, who became widely worshipped as a goddess of compassion. 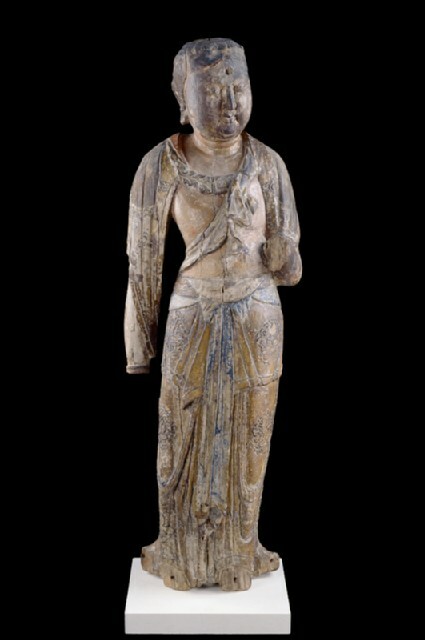 This figure is from northern Shaanxi province, possibly the Wutai mountains, an ancient holy site of Buddhist pilgrimage. The picture shows the Wutai mountains as painted in AD 961 in a Buddhist cave temple over 1,000 miles away on the Silk Road. Purchased with the assistance of the Art Fund, S. Wheatland Fisher, the Friends of the Ashmolean Museum, an anonymous benefactor, and the Dr Mortimer and Theresa Sackler Foundation, 1999.